Dampier also did not state where the events that led to the loss of his ship took place and a long-standing island ‘tradition’ had it that his vessel lay in South West Bay. As one example, an account appearing in J.E. Packer’s The Ascension Handbook: A concise guide to Ascension Island (1968) reads thus: 1701 - Wm. Dampier’s vessel ‘Roebuck’ wrecked probably near S.W. Bay. This belief that the wreck lay in South West Bay apparently was partly the result of the location of two ancient anchors there (Packer, 1968). It is also reflected in the exhibitions at the Island’s Museum as these also referred to South West Bay as the most likely site. Further, in a short précis entitled Wrecks Around Ascension Island that was produced in 1993, author Jeff Cant, also comments that ‘South West Bay seems to be the most popular choice for the beaching’. In presuming that, as Dampier fails to mention the ship after it was beached, Cant was of the opinion that Roebuck most likely ‘broke up due to the action of the seas’ (Cant, 1993). Part of the reasoning behind the ‘South West Bay’ hypotheses also appears to be deductions based on the naming of a freshwater spring on the north-west side of Green Mountain on Ascension Island ‘Dampier’s Drip’. Because Dampier recorded he had to travel over a high mountain to access a spring, this led many to concluded that the wreck lay somewhere other than in bays on the north-west side of the island. A reading of Dampier’s own account above indicates that the name given to the spring on the north-west face of Green Mountain was in error, however. In examining Dampier’s own accounts and in plotting the positions he gives for his vessel it becomes apparent that of all the potential places on the Island, only Clarence Bay on the north-west side fits the bearings he recorded as he came to anchor in a sinking condition. Testimonies provided at the subsequent court martial into the loss of HM ship Roebuck and the logs of the vessels that rescued Dampier and his men all lead the researcher to focus the north-west side of the island. The following précis from David Hepper's 'British Warship losses in the Age of Sail' is but one indication that many others had previously followed this same line of reasoning. Returning to England after a voyage of exploration to Australia and New Guinea, a bad leak was discovered in the larboard bow as she approached Ascension Island. Further considerations in developing the Western Australian Maritime Museum’s search strategy were the methods and equipment utilised by the Joint Services team that performed an extensive search in 1985. While also believing that the site most likely lay in Clarence Bay, in The Long Beach area, they also examined South West Bay and English Bay in their search for the ship (see following). Dampier left such a vivid and accurate account of the area in which his ship was lost, that I was able to find it in less than 20 minutes of diving. With the assistance of several amateur divers from the missile tracking base, we recovered a large number of interesting artefacts which we donated to the local museum. This claim came as quite a suprise when it was received in August of 2001, six months after the Museum’s team returned from Ascension Island, given the continuing conjecture on the island as to the whereabouts of Roebuck that existed right through to March 2001 amongst service personnel, amateur historians and museum officials on the island itself. The claim, which is considered to relate to a nearby wreck, but not Roebuck, is dealt with at length in the Museum’s report on the expedition. Commander John Bingeman, then a serving Royal Navy officer, had also conducted an extensive search for wrecks off the west coast and around English Bay. His primary focus was the location of HM Ship Roebuck and his team initially searched South West Bay, Roebuck’s 'traditional' resting place. Commander Bingeman advised that these searches were conducted utilising a towed diver system from an inflatable boat and he indicated that his ‘servicemen considered they were being used as shark bait’ in the process. 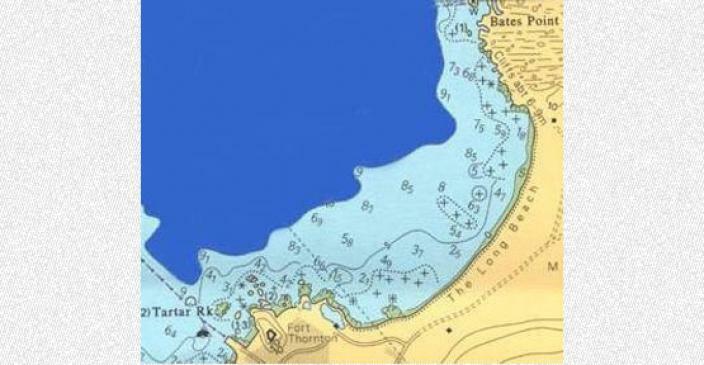 In being unsuccessful, and in reassessing Dampier’s log, Bingeman shifted his focus to North West Bay (Clarence Bay) off Long Beach and concluded that the wreck lay buried in the sands off the centre of Long Beach. Despite many hours of towed searches the team failed to find any trace of Roebuck. Commander Bingeman also conducted an extensive archival study and inspection of three wrecks in the area Normandie (1900), HM Store Ship Maeander (1870) and a site in Powerhouse Bay that appear to be a conglomeration of HM Store Ship Tortoise (c. 1859) and the Soudan (1892). (Bingeman to McCarthy, 14/10/2001). His work appears to have provided the groundwork for the 1985 search, following. In part, the archaeological aims of the expedition were achieved, except in the unsuccessful search for the Roebuck. Owing to the highly magnetic nature of the volcanic rock and the serious interference from all the communications equipment and satellite aerials situated on the island, the full potential of the magnetometers was not achieved. However, the magnetometers were used successfully in locating the wreck sites of the iron ships and the task of locating these areas would otherwise have been much more difficult. Extensive searches were made in the seas off Georgetown (the capital of ASI) and southwards to South West Bay. Underwater sleds were used to good effect in carrying out the required search patterns. He then concluded that the wreck most likely was to be found off Long Beach (see following). By this means North West Bay became the focus of attention, tallying with our Ascension Island liaison officer Flt Lt Richard Burke’s belief that the wreck was most likely in those waters. An analysis of the primary documentary evidence, a précis of which appears in the Museum’s report, shows that after first anchoring his vessel in 10 fathoms of water off North West Bay and concluding that he could not save Roebuck, Dampier would have had some time to consider his options before driving the vessel towards the shore, where as the breeze dropped, he again anchored. After sending an anchor ashore, he hauled the vessel in further until it came to rest in three and a half fathoms (7 metres deep) of water a cable’s length (c. 200 metres) from beach. The evidence contained in his depositions to the Court when read carefully against those of the others who also did so, e.g. the Master, indicate that the wreck lay in water no more than three and a half fathoms (7 metres deep) off Long Beach. Confounding the matter and making what appeared to be an apparently straightforward conclusion problematic, was the fact that none of the vessels that came into what they called ‘Ascension Roads’ in April 1701 and anchored ‘close to’ in Clarence Bay, saw the wreck. These were the 350 ton East India ship Canterbury and HM Ships, the 620 ton Anglesey, the 384 ton Hasting and the 6th rate Lizard. The wreck should have been visible not much more than a few cable’s length away towards the shore (a distance of c. 500 metres). Instead the three ships noticed Dampier’s men first, an apparent indicator that the wreck was then totally submerged, having broken up, was lying on its side, or equally that it was lying somewhere out of their view, possibly even against a backdrop of cliffs at the northern or southern ends of the beach. It seems most likely that the Roebuck lies underneath the deep sands of Long Beach at Georgetown, and the wreck will probably only be located either after a heavy storm that may shift the sand, or by the use of side-scan sonar or other sub-surface search equipment. The World is apt to judge of every thing by the Success; and whoever has ill Fortune will hardly be allow’d a good Name. This, my Lord, was my unhappiness in my late Expedition in the Roe-buck, which founder’d thro’ perfect Age near the Island of Ascension. The truism in the opening sentence is ages old! The use of the phrases ‘foundred at Sea’ and ‘founder’d …near the Island’ led one to the conclusion that though it had been warped ashore at Clarence Bay, there was a distinct probability that HM Ship Roebuck may have finished up in deeper water off the Island. This could only have occurred if the cable holding the wreck to the shore parted and it could have had drifted back out to sea with the prevailing winds as a semi-submerged derelict. In planning for the Museum’s first visit, it was decided to opt for the first model, i.e. to base the search on the assumption that the ship had not drifted back out to sea and that its remains still lay near the position at which the ship was abandoned . It was realised that the first task was to follow Dampier’s recorded movements as his ship slowly sank beneath him by fixing his compass bearings and anchoring where and as he described the event in 1701. Then, if these still supported the notion that the ship was run ashore at Long Beach, rather than South West Bay or any other locality, to rigidly focus the search in shallow water a maximum of 200 metres from the present shore at Long Beach in Clarence Bay. In accepting that the beach may have subsequently covered the ship, or that it lay buried under sediments offshore, a combination of visual and remote sensing searches (magnetometers) were planned and minimal- disturbance water-powered sand probes were proposed as a first stage in what was expected to be a prolonged campaign, taking a number of seasons. If results indicated that the vessel was not in shallow water or under the beach, a deep-water search using visual and remote sensing methods (e.g. magnetometer and side scan sonar systems) would need be conducted in later years. Finally, in conducting an internet search under the headings ‘William Dampier, Roebuck and Ascension Island’, an analysis by Ascension Island resident and researcher Mr Neil MacFall was found in electronic copies of the Islander for the year 2000. In noting the impending arrival of the Western Australian Maritime Museum’s team, he wrote under the heading ‘Where is Roebuck’ as follows. … tradition says that it was wrecked near South West Bay and that the crew survived on the Island by following a goat to a supply of water at the place that is now called Dampier's Drip…In fact this log of Dampier's will bear closer inspection because if it is read carefully it will reveal that the "Roebuck" is very unlikely to be found off South West Bay at all. With a diving party expected on the Island to search for the wreck I thought it might be a good time to open a discussion on where the ship may now lie and therefore offer my theory to (hopefully) open this forum. … The area around South West Bay would not offer a safe or even convenient anchorage. Dampier's log for 23 February 1701 states:- "at 9 anchored in 10 and a half Fathom, sandy Ground. The South-point bore South-South-West distance 2 Miles, and the North-point of the Bay, North-east half North, distance 2 Miles"
The sighting of a point of land two miles to the southwest straightaway rules out South West Bay. The only area where this could apply would be on the north eastern side of the island between Bottle Point and North West Point - or in "English Roads". The second point of the description "2 Miles to the North-east, half North" could apply to anywhere on the south coast or the west coast from South East Bay to "English Roads". Therefore the only place to fit both descriptions would be "English Roads" or as we call it Clarence Bay. Neil MacFall used this research as the basis of the design for an issue of Ascension Island stamps commemorating the Tri-Centennial of the arrival of Dampier in February of 2001. Presented to the Museum team on arrival at Ascension Island the next month, the stamps carried a depiction of events that was later to prove to be remarkably accurate. Artwork, produced under instruction from the Administrator and Neil MacFall for the Dampier Tricentenary stamp issue, showing his analysis of the location of the wreck. Built to lines and general arrangements produced by noted South Australian historian and historical naval architect Bob Sexton, a 1:24 scale ‘model’ of William Dampier’s former fire ship the 5th Rate Roebuck was recently completed and donated to the Museum by Clive Gordon. The model, with a backdrop of one of Sexton’s plans with rigging, is presented as a ship being readied for sea with yards, sails and guns being sent aboard and it appears alongside a replica of the ship’s bell and a clam shell known to have been recovered by Dampier. With Mr Gordon’s family present, the exhibit was unveiled by the WA Museum’s CEO Alex Coles (OBE) at a ceremony in the Museum’s Shipwreck Galleries. Though no portrait or dockyard model of Roebuck has been found and though the two battle scenes in which it appears are of a scale too small to provide useful information, Sexton’s analysis and Gordon’s model are now the definitive work. Clive Gordon, an experienced model maker (with Zuytdorp and a number of 19th century vessels to his credit), decided to commence work on the model soon after a WA Museum and private enterprise team headed by the author located the wrecksite on Ascension Island in 2001. He was then put in touch with Bob Sexton who after providing great assistance to the Museum in times past joined the Roebuck team with the express purpose of utilising his widely acknowledged skills in producing an exhaustive analysis of the vessel. Data consulted over a period of four years were found in archival records; Dampier’s accounts; legal papers; Navy board documents; an analysis of fireships of the 1689-94 program; Keltridges famous plans of 6th Rate ships of 1684; draughts and model of the fireship Griffin; an outstanding Fireship model in the Roger’s Collection (USN Academy Museum); and finally the long-lost contract between the Admiralty and Edward Snellgrove for building Roebuck itself. After considerable effort and research skill this was located together with the contract for 16 other fireships by contract Research Hannah Cunliffe of London. Archived in the PRO under the unlikely heading ‘Contracts and certificates as the sick, wounded and dead’ 1676-1710 it is of crucial import as was account of the building of Griffin in accordance with the same contract document. Though Bob Sexton’s comprehensive report (with appendices and lift-outs) is a substantial tome of over 200 pages with 14 arrangement drawings. Completed in 2004, it remains ‘under wraps’ as he proceeds towards publication, firstly as an article in the coming AIMA Bulletin and later in a comprehensive format, hopefully as a Special Publication celebrating Roebuckas one of the great elements of Australia’s Maritime Heritage Abroad.